I’m supposed to discount Tom Watson’s 60-plus years? Media topic you really don’t need to think about: The FedEx Cup format. It’s an imperfect game, there’s no perfect solution—just let ’em play. In Medias Rant: "...and I’m supposed to discount Watson’s 60-plus years of respecting the traditions of the game just because some whiny, spoiled kids are too afraid to trash-talk Phil and too lily-livered to speak on the record about..."
Word of the day: metanoia; noun; change in one's way of life resulting from penitence or spiritual conversion. In case you missed it: Bill Murray talks some golf with Howard Stern, including his early caddying days. The non-golf parts are also excellent, with the comedy legend speaking openly about a few movies and the finer elements of his craft. Private Hole of the Week: The long par-four 18th at Moselem Springs Golf Club. One of the great finishing holes in the region brings high drama to many amateur events held there, including the annual Hawley Quier Memorial. I’m usually "anti" water on finishing holes, but this is an undeniable classic, also overlooking the fact that out-of-bounds is almost absurdly close to the green on the right. 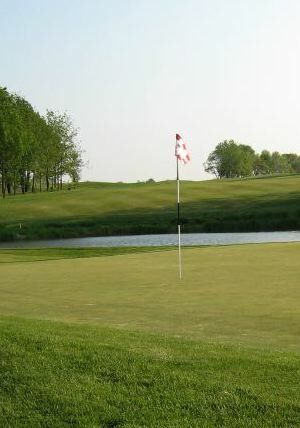 Public Hole of the Week: The par-five eighteenth at Turtle Creek Golf Club in Limerick, PA. Another water finishing hole, a pond guards the green. The thirds shot is often a pitching wedge off a downslope, which makes it dicey and fun. Philly Insider: After birdieing the final hole at Turtle Creek, you might want to treat yourself to one of the awesome Prime Rib sandwiches at the Trappe Tavern just down the road (also a great place to watch some NFL). Irony of the week: The slower you swing, the farther the ball goes. Water Cooler Debate: Who is most to blame for bringing golf to the Olympics—Tom Meeks, Judge Elihu Smails, or Vladimir Putin? If this "experiment" lasts more than one Olympics, though, here are a few good ideas to fix it from Shane Ryan at Golf Digest. Stats of the Week: Courtesy of Golf Digest’s year-end run-down, two mind-numbing putting stats. 1. Brian Stuard went 395 straight holes without a three-putt. Let that sink in. 2. Gary Woodland just finished his second straight season without missing a putt from inside of three feet. That’s 1,641 out of 1,641. In case you missed it II: Rory McIlroy putts into a bunker. It’s forgivable—it was the Road Hole Bunker at St. Andrews. In case you missed it III: Former Masters Champion Sandy Lyle wins the World Hickory Open. Sneak peek: Chambers Bay is next year’s U.S. Open site, so the USGA posted some stunning pictures of the course. The links course on Puget Sound near Seattle reminds one of the Kohler courses in Wisconsin—Whistling Straits and Blackwolf Run—which run along Lake Michigan. Designed by Robert Trent Jones II, Chambers Bay is also Audubon Certified Silver Signature Sanctuary Courses. A brief history of the course and a good definition of a "links" course is here. Prediction: The 2015 season will start this coming Thursday at the Frys.com Open at the Silverado Resort in Napa, CA. That beautiful location will hopefully lure some A-list talent, but wouldn’t it be hilarious if an earthquake aftershock affected the outcome, a la Danny Noonan’s final putt in Caddyshack? Stat of the week: At the 2014 Ryder Cup, Europe had 110 birdies; USA, 78. That’s a blowout no matter how you slice it. But I’m sure "pods" is the answer. Just ask Phil and Zinger. Water cooler debate: Phil Mickelson has a habit of airing out grievances publicly. The public seems to give him many verbal mulligans. Is it the "aw shucks" grin that makes him so endearing? Word of the week: Inveterate; adjective, long-established, as a habit. Lady golfer on the rise: Is she the women’s version of John Daly? No, she’s not a drinker and gambler, as far as we know, but she does have one of the longest swings you’ll ever see. She’s Sakura Yokomine, currently No. 44 in the Rolex Women's World Golf Rankings. Media topic you really don’t need to think about: Rory. Anything Rory. His Twitter feed, wearing kilts, yadda yadda yadda. He’s a good kid. Just let him live his life for a spell. Private hole of the week: The best short par-four in the region has to be No. 10 at Merion, a 300-yard dogleg left with a green that runs away. There are risk/reward calculations each step of the way no matter how you play it. The greatness of the design was evident at last year’s U.S. Open, where some players used five-iron off the tee, some used driver, and the rest used every other club in between those two. I’ll bet a few players even used a different club each day. 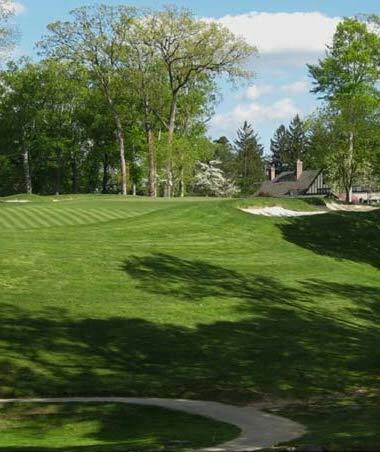 Public hole of the week: Another devilish short dogleg par-four in the region is No. 5 at Bella Vista Golf Club in Gilbertsville, PA. At just over 300 yards, a creek running across the hole forces a tough decision. Who wants to lay up with an eight-iron, after all? If you go bold, you’ll often end up one of the large, deep bunkers fronting the green. So swallow your pride, and pull the eight-iron. Prediction: Europe wins 15-13. Do I need reasons? If I do, then I’ll go with experience, vitality, and verve. And home field advantage. And they are better. Media topic you really don’t need to think about: Rory and Graeme and their lawsuit. I fear it will come up once an hour on the telecasts. Yawn. Word of the day: Omphaloskepsis – noun; contemplation of one's navel. Navel-gazing, used as a criticism, means overly self-absorbed focus on a topic. Example: "Media Wonders Why Media Over-Hypes Ryder Cup Rivalries." In case you missed it: Michelle Wie won the prestigious, inaugural Annika Major Award. In Medias Rant: "...and how can the first time an award is given already be Ôprestigious.’ Wie only played four rounds in two of the five majors! And five majors is an abomination to all that is natural and good..."
Private Hole of the Week: The 14th at Rolling Green (Bausch Collection/Rolling Green). One of the most intimidating tee shots on a par-three you’ll ever see. Uphill, an angled green, deep bunkers, and a steep drop-off on the right. It feels like your best shot will also need some luck to find the dance floor, and if you don’t hit the green, you’ll be lucky to make bogey. Public Hole of the Week: The 15th at Galen Hall. More infamously known as "The Moat Hole," famed architect A.W. Tillinghast may have had a hand in this unique par-three. Also extremely intimidating, top amateurs in competition have been known to lay up for a better chance at par, on average. Irony of the week: The less time you have, the more you get done. "You Kids Get Off My Lawn" Comment: The Ryder Cup competition was established to promote sportsmanship and camaraderie. They should change the name. It now promotes gamesmanship and jingoism. Stat of the Week: Billy Horschel was ranked 1st in putts from 15 to 20 feet for the 2014 season. In all other putting distance ranges, he ranked worse than 50th. Does not compute. Water Cooler Debate: Michael Jordan caused the USA team to lose the last Ryder Cup, in Chicago. Because, in trying to get into Ian Poulter’s head, he managed to achieve the opposite of the intended result. Poulter’s defiant passion fueled the European team on to victory. What are your biases in golf? The last part of the season just flew by, with 16 days of competitive rounds in 25 days. That’s 64 percent of the days of the FedEx Cup in the heat of competition. It’s perfectly fine for football and hockey be battles of attrition—not golf. But why is that a knee jerk reaction? Do I have latent biases that prevent objective reporting? Of course I do. One of my biases that I’m getting over is the resistance to the rise of the golfer/athlete. Somehow, in a traditionalist’s mind, the delicate touch of a golfer would be inversely proportional to their brawn. This turns out to be not so true. Regardless of what you think of the politics of Glenn Greenwald (bias: I admire constitutional lawyers who don’t pull punches) and the whole Edward Snowden affair, Mr. Greenwald has no qualms decrying the fake objectivity of "traditional" journalism. In fact, he posits, true objectivity is pretty much impossible. We all have biases, we all interpret events through our own lenses, so let’s put them on the table and be honest about it. But, no matter how obvious a media outlet bias is, the tone of its "reporting" or opinionating can define the media conversation more broadly. I’m not sure what media conversations that Golf Digest is trying to introduce these days, but I guess all is right in the golf world again now that actual professional golfers are back on the cover of Golf Digest (bias: I feel betrayed by new magazine redesign). Yes, Michelle Wie is on the cover, the epitome of golfer/athlete, and my pick, earlier this year, for having a breakout year (biases: Leadbetter fan and defender of the persecuted—I’m looking at you, Michael Bamberger). Wie was just recognized with the Rolex Annika Major Award for best performance across all five majors. If you didn’t know what that was, don’t worry—it’s new. And another superfit golfer of note is Suzann Pettersen (bias: I love a woman who drops the F-bomb on live TV). I believe her best days are still ahead, and she had 10 top-10 finishes in 18 tournaments this year. Speaking of athletes, javelin-thrower turned golfer Keegan Bradley (bias: Keegan is a cool name) has demonstrated that he’s no flash in the pan. If you get to spectate a PGA event next year, check out Keegan’s ball rainmaker ball flight. It’s impressive. And Bernhard Langer (bias: my maternal grandfather was German; Mercedes-Benz; Altbier) was just unbelievable in the Senior Open Championship this summer. In case you missed it, Mr. Langer topped off his victory with whipped cream and cherry on top, with the classiest of finishes. On the impossibly hard and fast Royal Porthcawl Golf Club links in Wales, no one in the field had been able to get close to the 18th pin on the approach—even with a wedge in hand (bias: links-style golf is more fun to watch). Already having lapped the field, there was no need for theatrics. Nevertheless, he hit a perfect 9-iron approach, landing just over a fairway bunker and releasing to about 20 feet from the pin. An eagle might have been too much to ask for, but a tap-in birdie seemed the right level of "I make this game look easy." But I digress. Many have biases about Golf Channel personalities, and for good reason. There is much room for improvement, and sometimes a pretty face is just a pretty face. As for Brandel and Frank, my bias is in favor of first-hand expertise. For all their faults, they still bring a lot of knowledge to the table. Steve Flesch and Charlie Rymer, on the other hand, don’t seem to remember what playing professionally was like. The Golf Channel dropped a few notches in my esteem when I was looking for wrap-up analysis of the Women's U.S. Open this summer—and found almost none. I imagine this was the result of some television network executive bickering, but disappointing nonetheless. Which brings us to the golfer/athlete of the moment—Billy Horschel. His phenomenal performance of back-to-back wins and 12 consecutive rounds in the 60s was surely do in no small part to his fitness. So, the golfer/athlete is here to stay, especially if the FedEx Cup system survives the critics. Even Rory (bias: red hair like me/Ireland connection) is looking ripped these days (bias: he’s shorter than you think). And let’s give Billy a pass on his loss of decorum when he did seven full Gator Chomps on the 18th green after his FedEx Cup win. Oh yes, my bias is clear on Horschel: My wife is a University of Florida alum. I deserve your sympathy, but for the grace of God go you. In our house, patriotism for your country plays second fiddle to allegiance to the Gator Nation. Chomp Chomp. 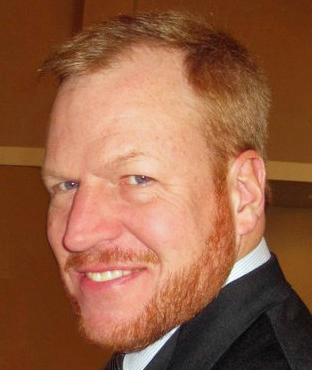 Ron Romanik is principal of the brand, marketing, and packaging consultancy Romanik Communications (www.romanik.com), located in Elverson, PA. His full bio is here. The irony of my argument here is that the Greatest Open Champion Ever (G.O.C.E., if you will) earned that title by not becoming the "Champion Golfer" of 2009. He lost, instead, in an illegitimate playoff format. (18 holes on Monday is the proper way to decide a Champion, and I am confident he would have fared much better there). This man’s second place finish, though, should still be considered one of the greatest sporting achievements of all time. To some, though, that "loss" five years ago was very disappointing. I don’t quite understand this. Even Tom Watson himself bemoans his fate: "It was in my grasp, and it hurts, it really hurts. It was a huge disappointment." But I ask you, how many golfers on this planet would not have gladly exchanged places with Mr. Watson at that moment? He had a glorious run that week, and at age 59! This week, at 64, he made the Open cut again at Royal Liverpool. And what was the final obstacle the thwarted his sixth Open title? A two-foot diameter "nose" on the front of the 18th green that deflected an otherwise perfect approach, and sent it careening off the back of the green. But my real question is: Why would he, or anyone, now look back on that week with sadness or disappointment? Why not instead admire his performance in isolation and wonder at the amazing athletic and sporting feat that it was and always will be? Watson does admit that he was comforted by the outpouring of support and notes thanking him for his inspiring performance. By why isn’t that the rule, rather than the exception in fans’ hearts and the media’s recollections? For many, he "lost." Not to be melodramatic, but is this damning evidence of our societies’ ill-founded emphasis on "winning is the only thing"? (Thanks a lot, Red Sanders.) I, for one, don’t think it is human nature to look at the runner-up as the "first loser." On this past Thursday evening, GolfChannel’ Kelly Tilghman introduced a segment on Tom Watson’s run in 2009 with a "sad face" grimace, saying: "It’s no exaggeration to say that he was on the verge of producing what could have perhaps been known as the greatest sporting accomplishment of all time." I posit that—win or lose—his accomplishment was equally as impressive—and great. Other circumstances or facts could have made it truly tragic. If he hadn’t already won five Opens, for instance. If his career might be defined by this single losing event. Or if this loss irrevocably damaged his psyche in the prime of his career. But none of these scenarios apply. I would prefer to look back on Watson’s performance as a crowning coda to a full and rewarding career. Or a swan song, victory lap, or farewell tour. Perceptive readers will no doubt suspect that I have a soft spot for Mr. Watson. Watching him win his Opens as an adolescent, I was both fascinated by the traditions of the game and intrigued by the way the Scottish and English fans embraced their likeable American Champion. Too bad fans don’t raise golf champions on their shoulders anymore like they used to in Bobby Jones’ era. That would have been a fitting tribute for Mr. Watson. I admired Watson for categorically conquering the quirky and whimsical nuances of the game in its original form that is, in many ways, foreign to the American style of play. And I always liked how the knowledgeable golf fans across the pond reacted to action with the right amount respect and gravity correspondent to the situation. Of course, the crowd energy instantly deflated when they saw Watson’s approach to 18 skip through the green in 2009. The faithful had been pulling for him to win the whole week. And I won’t begrudge anyone for questioning his decision to use putter for his third shot. I might defer to the caddie, though, who believes 100% that the putter was the right choice. But the larger begrudgement still remains. In my rewriting of history, the R&A never adopts the abomination of a four-hole playoff, allowing Watson glory on Monday. For the record, the R&A only abandoned the 18-hole playoff in 1985, two years after Watson won his fifth Open Championship. I’m sure he would have prevailed in a "real" playoff. By the way, the ageless 64-year-old wonder shot 68 today at the Open in Liverpool, and finished at +1, three better than Stewart Cink. But Cink will always be able to brag about the crowning achievement of his career, the day he stared down a man 23 years his senior and trounced him fairly and squarely—for four holes. There are many reasons to pull for Bubba Watson as a favorite to win the U.S. Open. And there are a few reasons that I can understand that he might not be everyone's cup of "T," if you know what I'm getting at. His limited range of beverage choices aside, and his occasional temper tantrums aside, the best reason to love Bubba is his utter uniqueness. He is the John Daly of this era, a sort of anti- anti-hero. Bubba's swing is an affront to all that the established golf elite wants to convince you about the golf swing. It's a self-made wonder that defies a great deal of logic, tradition, and physics. That is also effective at winning majors is an amazing bonus. Winning the U.S. Open at Pinehurst would be the equivalent of a thumbed nose to tradition in a way that John Daly didn't even achieve at The Open Championship at St. Andrews, though Daly deserves all the kudos he receives. Some call Pinehurst the St. Andrews of America, and for good reason. The resort represents some of the best qualities of American golf. What a perfect place to throw shade over the stuffy ideals of the establishment. Instead of Waffle House for a victory breakfast the morning after, after a U.S. Open win, he should order Dominos delivered to the pressroom. And Pinehurst just might be the ideal venue for a Bubba U.S. Open win. No rough at Pinehurst means it's possible to get lucky and find a few good lies in the waste areas the line the fairways. Bubba will also be able to hit less club off par-four tees to keep the ball in play. But again, the fact that no golf teaching pro in the known universe would teach a swing like Bubba's is enough reason to root for him. And several corollary sub-reasons: 1) Bubba proves that established and fashionable teaching philosophies of the current and past ages are not the answer for everyone; 2) golf needs more personalities; 3) golf needs more creatively played shots; 4) he's not afraid to be whoever he wants to be; 5) he’s a lot more fun to watch than Adam Scott. It was easy to shrug off Bubba before his second Masters win this year. Many, many top golfers have only one major. But now that he's got two under his white belt, and now that he's within striking distance of No. 1 in the world, he can no longer be dismissed so easily. Simply said, I'm pulling for Bubba because he doesn't fit anyone's definition of a pro golfer. I like to pull for the underdog, the outsider, the misunderstood. He is all of those, and he has no reason to apologize. In the picture here, Bubba has just hit one of the defining shots of his career. A shot only he would attempt. A shot only he could pull off in that situation. Okay, maybe Tiger and maybe Dustin Johnson could pull it off. 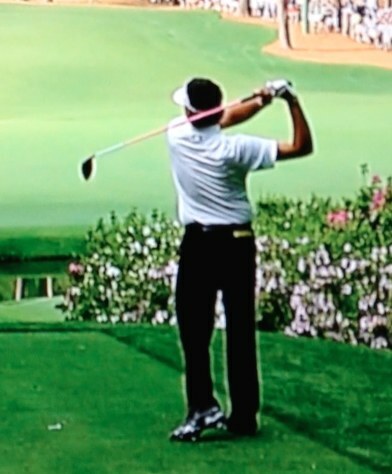 Nevertheless, Bubba’s follow-through at 13 at Augusta on Sunday epitomizes his appeal. After carving a high, controlled slice over the corner trees of the dogleg, his right foot has moved a full foot from its starting position. Just amazing. The shot came off, and Bubba was on his way to his second green jacket. I'm rooting for Bubba because if he bucks tradition and wins the U.S. Open with his wild style, I can't wait to see the look on the faces of the USGA elite hell bound to protect an unnecessary level of decorum and tradition that can put casual golf fans off. Which brings us to the idea of tradition and Pinehurst and the USGA. I hope this experiment in a "no-rough" open is not a one-off. 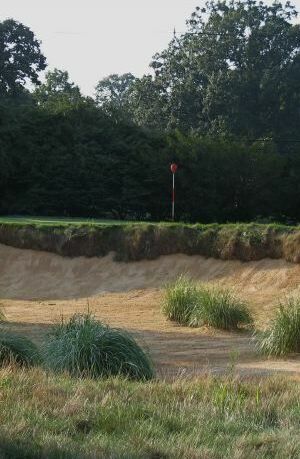 The fact is, preparing U.S. Open courses with thick, high rough is a tradition that is not traditional. Well, that depends on your definition of tradition, I suppose, and how many years it take before something becomes traditional. I believe the impossibly high rough trend took hold mid-20th century, when Hogan was at one of his peaks. He remarked after one U.S. Open round that he didn’t miss one fairway, but his shoes and pant cuffs were still soaking wet. This side anecdote illustrates the newness of the high rough concept, because they hadn’t yet realized that a walking path through the rough from tee to fairway made more than a little sense. But tradition is, of course, not only a matter of years. If it were, major championship courses should be set up more rough-hewn and natural, like Scottish links courses. But if you believe that the USGA has started a valid new tradition with impossibly high and thick rough, I can grant you that as well, and that is their right. Tradition is as much a consensus of "what is right." It would be quite a dramatic turnaround if the USGA would adopt a new Pinehurst-inspired model for most future U.S. Opens, but anything is possible. More likely, with the tanker-steering agility of the USGA, the tournament committee will gradually introduce more and more variety in their concept of rough in future venues. And that bodes well for a future U.S. Open win for Bubba, that is, if he doesn’t win a British Open first and celebrate with a breakfast of haggis—or a KFC Double Down. What to get the golfer who has everything? Silly, useless knickknacks of course. Luckily for everyone, one man has taken on the responsibility to collect links to every "Ridiculous Golf Item" he can find. From the bizarre to the sublime, these items can clearly identify you as a golf fanatic, or just someone who likes to have a little fun, or someone who is just plain "off." Whether or not you wish to advertise to your boss where golf is on your priority list with a desktop golf curio is a separate issue you have to decide for yourself. Or, if you’re the gift giver, it might be a clever way to embarrass a golfer who would be compelled to actually use, say, a golf-bag-and-pull-cart golf-club pen set just because you gave it to them. I have read that one of the fastest and easiest ways to endear yourself to a new colleague, acquaintance, or friend is to be self-deprecating. Golf, it turns out, provides countless opportunities for this, both on the course and off. These fun golf gift items add yet another layer to that noble life goal. Of course, constant self-deprecation can make you look pitiful, so beware of that fine line. So, some of the items I’ve added to my Amazon Wish List are trays for making golf ball ice balls, a golf ball/golf club salt and pepper set, and a nylon golf ball spatula. And if you’re a Caddyshack aficionado... yes, naked lady tees are a reality. You can also buy a Judge Smails fedora hat ("Looks good on you, though.") or an orange Bushwood CC baseball-style hat like Danny Noonan wore. I already own one of these orange hats. And it’s good quality. But if you’re wondering... no, I haven’t had the courage to actually wear it on the course yet. It’s like wearing a bow tie on TV. Only a small percentage of the population can pull it off with style or grace. The excuse I tell myself for not wearing the Bushwood hat is that it still looks too new, too bright orange, and too obvious. It’s a Catch-22: You have to wear it so it will look worn, but you don’t want to wear it and look obvious. Maybe I’ll run it over with my car a few dozen times or leave it out in the sun for a month. So, I bought the hat in an effort not to take myself too seriously, and be endearingly self-deprecating. But I still can’t help but wonder if fellow golfers would see it as an innocent act of self-deprecation or a pitiful ploy for self-attention. I imagine this is an ongoing internal struggle for many (or maybe not). Whereas I’m frequently self-deprecating on the course, both during idle teebox chatter and during my pitiful short game, in golf attire I’m much more conservative. On second thought, in honor of Payne Stewart’s win at Pinehurst 15 years ago, I’m going to get me some tartan plus fours. I’ve toyed with the idea for decades, and now is the time. But you already know... whether I’ll actually wear them is a completely separate—and extremely heart-wrenching—moral dilemma.